Enjoy direct lake access for swimming and fishing in the summer and snowmobiling and ice fishing in the winter. Devil Track 219 is a spacious, private home located in the Devil Track Lake Resort area near Grand Marais, MN. This lovely, updated home features a spacious backyard with plenty of grass and mature trees. Enjoy direct access to Devil Track Lake. The spacious open living area features a living room, dining room, and kitchen. Relax by the window in the eclectic furnishings. There`s plenty of seating for everyone to sit back and reconnect to what`s important in the living room area. The centerpiece of the living area is this beautiful LED Quartz fireplace. The kitchen features newer appliances and a large island for preparing meals. This kitchen has a dishwasher, so no need to hand wash dishes during your vacation Never miss a moment while preparing a meal with this open layout living area. There is seating for six guests at the dining room table. The door in the dining room leads to the lake-facing balcony. Sit back and enjoy a cup of coffee on the lake-facing balcony. This spacious master bedroom is located on the main level and has a king bed and vaulted ceilings. The master bathroom has large closets, perfect for unpacking for your stay. The attached master bathroom has a shower/tub combo and spacious vanity. The first guest bedroom is located on the lower level and has a queen bed. The first guest bedroom also has this nice sitting area. The second guest bedroom on the lower level also has a queen bed. The second guest bedroom features a small closet for unpacking. The lower level bathroom has a shower/tub combo. There is also a half bathroom located off of the main living area. Upon entering the home you can go up to the main level living area or down to the lower level. There is a nice living area located in the lower level on the home, complete with a walkout area to the large backyard. The sofa in the lower level can be turned into a full sized bed for an additional sleeping area. The lower level living area features a Roku TV and wood burning fireplace. Devil Track Lake has 3 bedrooms, 2.5 baths with plenty of space for up to 8 guests. The front of the home as you will see it when you first arrive. The home features a small front and side yard with a spacious back yard leading up to the shores of Devil Track Lake. Located in a quiet residential area, Devil Track 219 is a great family retreat pictured here with Devil Track Lake 215 which is also available to rent through CVR. Enjoy time with friends and family in the spacious yard. Devil Track Lake Home 219 is a newly updated 2-story home located along the shores of Devil Track Lake just 8 miles up the scenic Gunflint Trail from Grand Marais, MN. Inside you'll find modern decor with a flare of mid-century modern. Enjoy the lake-facing deck or step out of the lower-level patio doors and enjoy the spacious backyard that leads up to the lake's edge. The home has 3 bedrooms and 2.5 bathrooms, including a spacious master suite on the main level. In addition to the two living areas, there's a full sized kitchen and a dining room area, a perfect gathering place for the whole family. Unique artwork and carefully selected furnishings make this home warm and welcoming. The beautiful wall to wall windows allow you to take full advantage of the Devil Track Lake views year round. Walk down to the beach with a fishing rod, or dip your feet into the water - it does get warm in the summer! In the winter it can be hard to tell where the land ends and the lake begins as you enjoy the expansive views of crystal white snow. Enjoy swimming, fishing, boating, water and jet skiing in the warm months. Then come back in the winter to enjoy snowmobiling, ice fishing, and more. 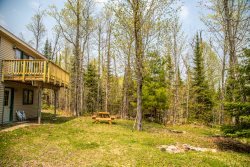 With easy access to snowmobile trails, this home is the ideal place to set up your base for a weekend of adventure, while being just minutes away from beautiful downtown Grand Marais. The home is located just a few doors down from the Skyport Lodge restaurant and bar, formerly The Landing, which is now open under new management. After a long day of snowmobiling or fishing come on in and enjoy a full menu or pull up a seat at the bar and have a drink with your fellow travelers and locals alike. Past visitors to Devil Track Lake Resort say that staying here is like being a part of a community and guests have been returning year after year. Come and be a part of the Devil Track Lake Resort Community!